Today we were exhibiting at the B2B Roadshow at the Village Hotel in Glasgow. What a fantastic venue! This was the first business event we have exhibited at for quite a while, so we were really excited to get out there and meet some new contacts. The event was really well attended, and we got to speak with lots of businesses about our Managed IT Support and how we help customers with their IT needs. We were lucky enough to get a chance to chat with Katie Bulmer-Cooke (http://www.katiebulmer.com) who was a contestant on The Apprentice in 2014. Katie had given a speech about her own rise to business success. I do enjoy listening to successful people talking. One thing they all have in common is that they all faced rejection and set backs in business, and interesting to listen to how they overcame those problems. Pretty inspiring stuff. This was also the first trial of our new ‘menus’, which Katie really liked and so tweeted a couple of pics to her followers! 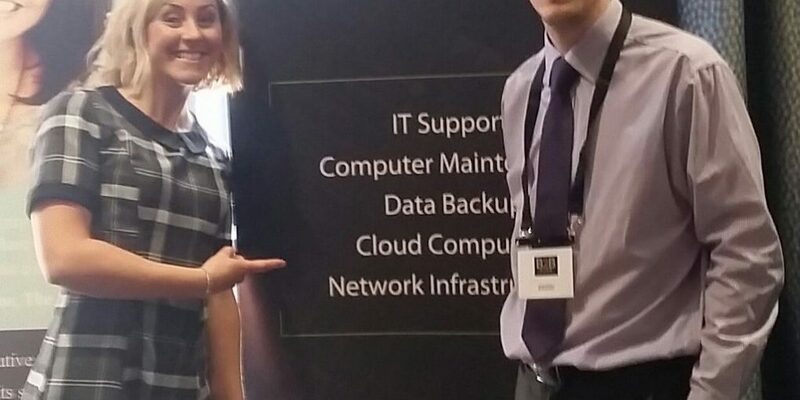 Where you can find us next: we’re exhibiting next month at the B2B Roadshow Forth Valley. More details can be found here. If you’re heading along pop by and say hello!